There are no “ifs” and “buts” in a designer’s career, he outdoes himself just to give his 100% so the clients would not object, ridicule or criticize his work. Well their story is worth to be told, they hardly take any offence even after a lot of ironical remarks, negative criticism, disapproval or depreciation. This is the true spirit of a designer, because he never feels low or dejected about himself, he has faith in his skill and he never doubts his potential. Obviously with experiences on the workplace and after errors/mistakes, any man and every man learns so is the case with designers. They always go about the ways to improve and do better job the very next time. Their acceptance of ground reality, their fleeting imagination, their true to type nature and their love for the job make them rise and shine. Suppose if a haughty and egoist doesn’t take criticism in a positive spirit, his chances of improvement and progress cut him a slack. Would you like to leave a negative impression onto your clients’ mind that in future you cut a sorry figure? Never, so always be down to earth, having the urge to learn and giving in what is due from your side. 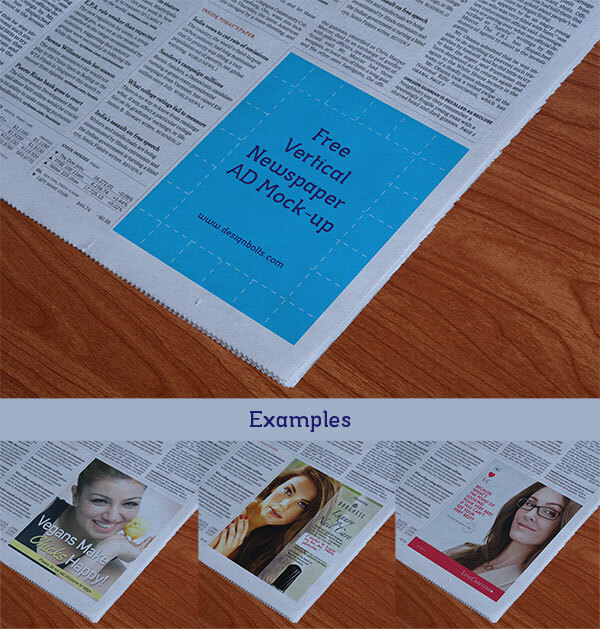 Now coming towards my today’s post which is unleashing a free newspaper vertical ad mockup PSD that is going to help you if you got a client asking for his ad display on the newspaper. You can simply insert in the ad design piece and use this mock in the matter of presentation. What a delight it would be for him to watch in the actual form, how his ad shall be pasted in the newspaper. Remember, if you don’t leave any room for mistake or disapproval, you eventually earn a bonus in the client’s eyes and he would rely on you and would trust your capabilities in future too. For more freebies subscribe us and don’t forget to leave your feedback, you know it is always welcomed and appreciated. Your reciprocity is overwhelming nevertheless! Very Nice Newspaper Vertical Ad Mockup. Thanks For Published This.